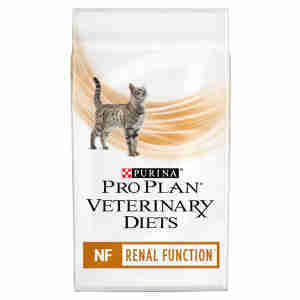 PURINA PROPLAN VETERINARY DIETS Feline NF Renal Function is a balanced feed suitable for cats who suffer from kidney disease. This is a delicious and balanced feed, which contains high-quality protein. *Note this feed is not suitable for cats that require a high protein or phosphorus intake such as pregnant queens and growing kittens. Dry Ingredients: Maize*, Rice*, Soya Meal*, Wheat Flour*, Maize Gluten Meal*, Animal Fat, Wheat Gluten Meal*, Digest*, Dried Egg*, Pea Fiber, Dried Beet Pulp, Dehydrated Poultry Protein*, Minerals, Fish Oil, Yeast * Protein Sources. Nutrition: Analytical Constituents, Protein: 26.0 %,Fat content: 12.0 %, Crude ash: 4.5 %, Crude fibres: 3.0 %, Calcium: 0.6 %, Phosphorus: 0.5 %, Sodium: 0.2 %, Potassium: 0.8 %, Essential fatty acids: 1.25 %, Additives: Nutritional Additives: IU/kg: Vit A: 30 000, Vit D3: 1 000, Vit E: 650, mg/kg: Taurine: 1 400, Ferrous sulphate monohydrate: 350, Calcium iodate anhydrous: 3.3, Cu(E4): 50, Manganous sulphate monohydrate: 108, Zinc sulphate monohydrate: 440, Sodium selenite: 0.30. Wet Ingredients: Water sufficient for processing, beef, poultry by-products, rice, meat by-products, chicken, calcium gluconate, powdered cellulose, artificial and natural flavors, guar gum, potassium citrate, potassium chloride, magnesium sulfate, Vitamin E supplement, choline chloride, taurine, carrageenan, zinc sulfate, thiamine mononitrate, calcium phosphate, ferrous sulfate, niacin, calcium pantothenate, Vitamin A supplement, copper sulfate, menadione sodium bisulfite complex (source of Vitamin K activity), manganese sulfate, pyridoxine hydrochloride, riboflavin supplement, Vitamin B-12 supplement, biotin, folic acid, potassium iodide, Vitamin D-3 supplement, sodium selenite. I-4569. Daily feeding guide: See table. It is recommended that a veterinarian's opinion be sought before use or before extending period of use. Recommended length of time for use: initially up to 6 months. For temporary renal insufficiency, the recommended period is 2 to 4 weeks. Water should always be available. *The recommended period of use is initially up to 6 months. It is recommended that a veterinarian's opinion be sought before use or before extending the period of use. Water should always be available. When Bella was diagnosed with Chronic Kidney Disease in November 2016 I tried a variety of renal foods, both wet and dry, with varying degrees of success. However, once I discovered Purina there was no looking back. She loves both the wet and dry food; ironically, my vet now feeds it to her cat after I provided her with samples of both varieties, even though the practice doesnt stock it! At Bellas 6-monthly blood test last month, the vet couldn't believe how well she is doing. The only downside of Purina Pro Plan renal food is that it is so tasty that my other cats are always trying to steal it! My cat has been on this for years so obviously it works ! Sometimes however it is different - both myself and cat can tell this - different colour and consistency. He still eats it but I get a funny look the first few times ! Good price and fast delivery. Greatfo od and service ,only fault cant get it in jelly. I like jelly better.